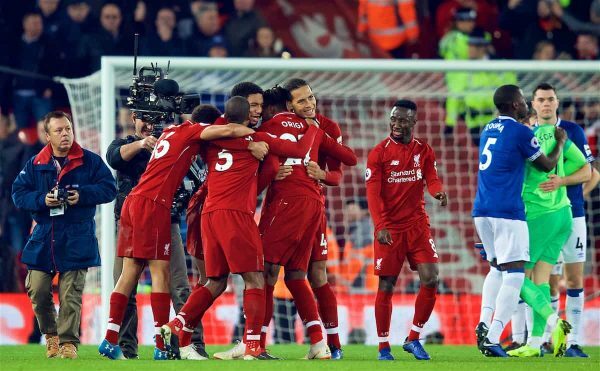 Liverpool’s 1-0 victory over Everton was one of their most enjoyable wins of the season, with several statistics catching the eye. 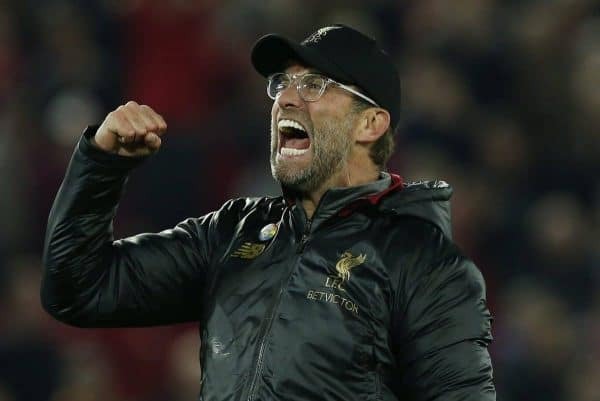 The emotion unleashed when Divock Origi headed home in the dying seconds was something to behold at Anfield, with Jurgen Klopp right in the thick of the celebrations. The Reds picked up not only one of their most famous derby wins in history, but also three more points in their quest to end their title drought. Once we had calmed down from Origi’s winner, we took a look around for some of the best post-match statistics. Here are five that stand out. You could be forgiven for thinking that Man United have scored the most stoppage-time goals since the Premier League‘s inception. It is Liverpool who top that particular table, however, with Origi’s memorable last-gasp strike seeing them pull further clear. The Belgian’s header means the Reds have netted 31 times from the 90th-minute onwards in the top flight since 1992. It also means Liverpool have scored more 90th-minute winners against Everton than any side has against another in Premier League history. Fergie time? Surely ‘Divock O’Clock’ has a better ring to it! It’s now 14 matches unbeaten, with Liverpool also racking up their best-ever points tally (36) at this stage of a Premier League campaign. This is now only the fourth time in history that two clubs are yet to be beaten 14 games in, with Man City also still waiting to taste defeat. Everton and Nottingham Forest enjoyed similar fortune back in 1978/79, but it was the Reds who ended up winning the title that season. Liverpool were involved in the other two unbeaten occasions, both with Arsenal, in 1990/91 and 2007/08. 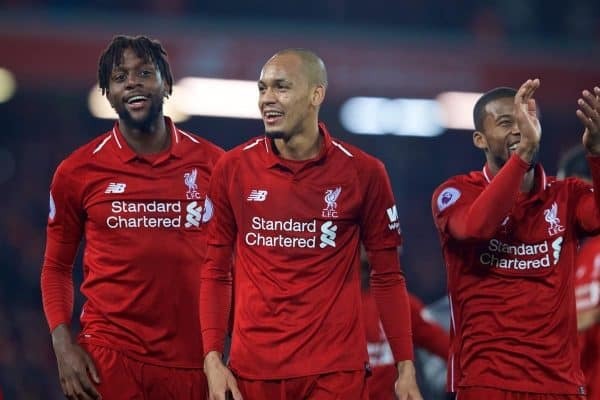 Fabinho was named in Klopp’s starting lineup in the absence of Jordan Henderson, with a huge opportunity to stake a claim. The Brazilian impressed greatly, especially in the first half, but looking closer shows exactly the extent of the impact he was having. No player on the pitch made more tackles (six) than Fabinho and his ability to break up play and do the dirty work was priceless. The 25-year-old is improving all the time, slowly demonstrating why he arrived on Merseyside with such a glowing reputation. 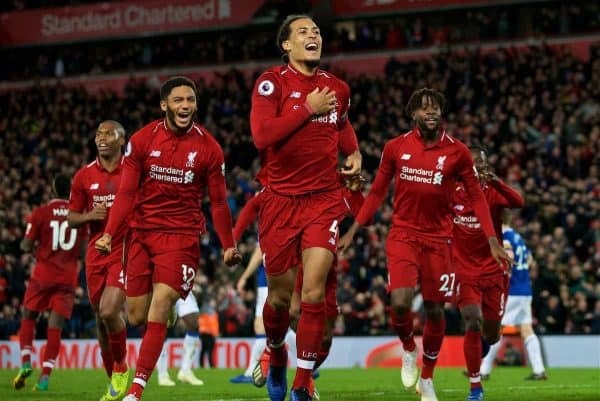 Liverpool have made Everton‘s life a complete misery this century, but the Blues threatened, at times at least, to finally win a derby fixture on Sunday. It is now 18 matches and counting since they last managed to beat the Reds, though, with that triumph coming back in October 2010—predictably during Roy Hodgson’s time at Liverpool. Only two derbies in British football have had longer unbeaten runs by one side: Hearts vs. Hibernian (22) and Chelsea vs. Tottenham (26). Just another nine to go without defeat for another British record, then! 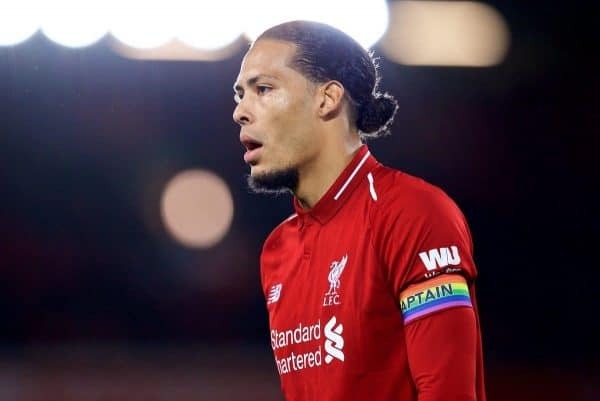 Virgil van Dijk was a colossus again for Liverpool, with his all-time great assist for Origi just the tip of the iceberg! The Dutchman was an unrivalled defensive presence on the day, keeping the dangerous Richarlison quiet and captaining the Reds superbly. 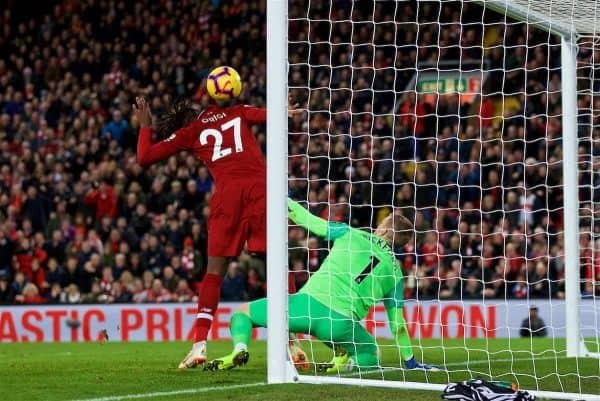 He had more touches (101) than any other player on the pitch, won six aerial duels, produced two blocks and kept his 17th Liverpool clean sheet in 41 appearances. The Reds’ best signing this decade? Quite possibly.